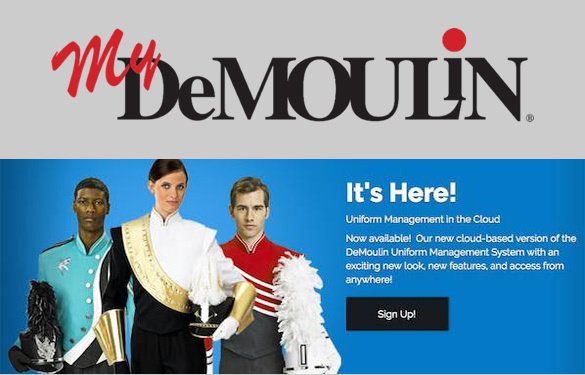 DeMoulin Bros. and Co. is pleased to announce the official launch of MyDeMoulin.com, our all-new cloud-based uniform management system. We have listened to your feedback and suggestions over the many years the UMS software has been available, and we believe that we have implemented many of these requests into this new platform. The biggest of these features is that this new system is completely “in the cloud.” This means no more worrying about your computer being re-imaged over the summer. No more trying to figure out how to transfer the software and database to another user when you pass the torch of uniform chairperson. And it’s still COMPLETELY FREE! We would love for you to give us your input as you begin to use this new platform. Please feel free to email us with any issues you may run into and any features that you think would be valuable to the marching band uniform community. To get started, just Sign Up at MyDeMoulin.com. When you first log in, you will be presented with a “Getting Started” page that will walk you through the process of starting afresh or migrating your data from your current software. For help getting started, please send an email to techsupport@demoulin.com or simply reply to this email. Because this software is offered free of charge, we don’t offer telephone support, however, we are very diligent about answering email requests for support. Please contact us by one of those means.